Heavy duty automatic clamping design. Outriggers stabilize the pipe during lift. The operator only has to guide the clamp into place. 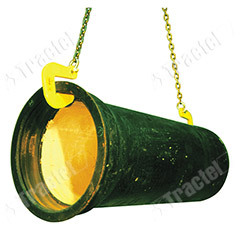 Pipes are handled quickly and efficiently when properly balanced. Excellent for cast iron, steel pipe, tubing, and other cylindrical objects. Pipe grab sizes listed handle ASA cast iron pipe – standard, extra strong, and double strong (all have same O.D. ).